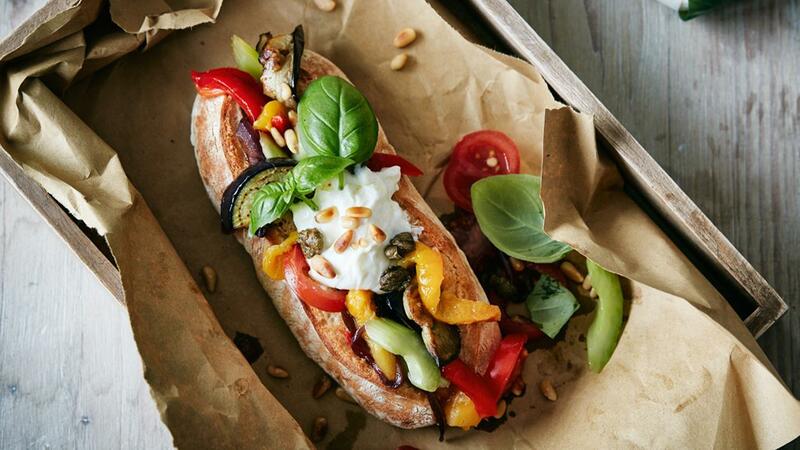 This Sicilian inspired ciabatta is a Mediterranean feast that is easy to prepare and serve; the caponata can be fully prepared during mise-en-place and you can assemble the sandwich in a wink. Roast the capsicums in the oven until their skin blackens and leave to cool. Remove the skin and seeds and cut in pieces. Cut the capsicums lengthwise in half and slice. Fry in olive oil until brown and tender and season with salt and pepper. Slice the onion in rings and add to the eggplant. Clean the celery sticks and slice. Half the cherry tomatoes. Add to the eggplant with the capsicums. Add the vinegar and the sugar, season to taste. Slice the ciabatta's open and fill with caponata and burrata. Garnish with toasted pine nuts and basil leaves and freshly ground black pepper.